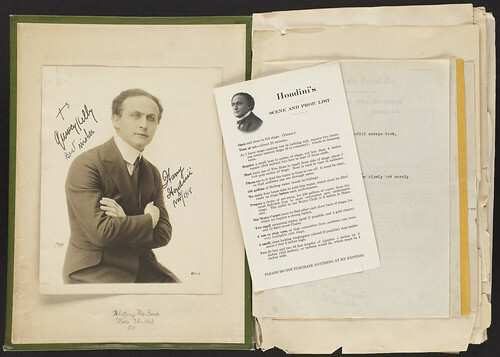 Pages from the Houdini scrapbook compiled by Houdini’s personal friend, Quincy Kilby. Kilby, a Boston theater character, also wrote a history of the Boston theater, and another book on actor/assassin John Wilkes Booth. He spent 20 years accumulating the items in his Houdini scrapbook. These include letters, newspaper clippings, and a very exacting scene and prop list. The entire collection is now part of the collections of the Boston Public Library. You can see more of these photos from the Library’s collection here. 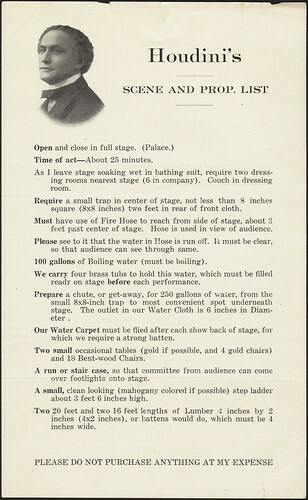 This entry was posted in Ephemeral Boston, Images and tagged Boston Public Library, Harry Houdini, Magic, Quincy Kilby, Scrapbook, Theater, Trap Door. Bookmark the permalink.